Tampa Bay Lightning | Vasilevskiy's Backup...Domingue or Budaj? Vasilevskiy’s Backup: Domingue or Budaj? 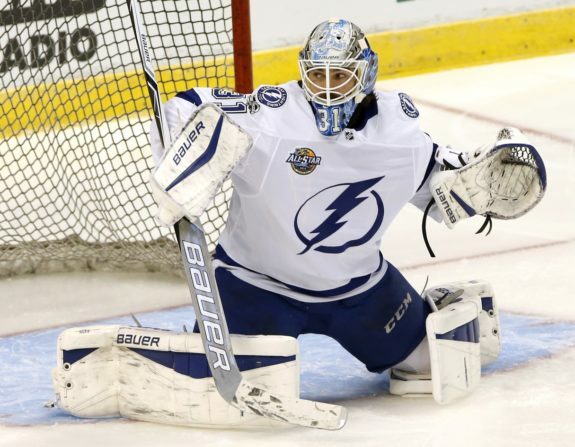 At the start of the 2017-18 season, the Tampa Bay Lightning’s backup goaltender situation seemed clear. After receiving goaltender Peter Budaj as a piece in the Ben Bishop trade with the L.A. Kings, he seemed to be the perfect fit for the Lightning. After playing well for the last month and a half of the season, the Lightning re-signed Budaj to a two-year contract extension in order to provide a veteran backup for Andrei Vasilevskiy, who was entering his first season as an NHL starter. The situation was perfect for Lightning, who needed an experienced backup who wouldn’t be a real threat to Vasilevskiy’s role in the crease. However, during Budaj’s seventh start of the season, he suffered a major leg injury causing him to land on injured reserve for the last two months. In his stead, the Lightning recalled Louis Domingue from the Syracuse Crunch, whom they acquired from Arizona this season in order to have some insurance in this exact scenario. Even before his injury, Budaj wasn’t exactly instilling confidence in the Lightning’s fanbase. While playing well enough to win about 50 percent of his games, he never looked confident in net. His statistics were bad (even for a back-up), posting a .878 save percentage and a 3.80 goals against average. After Budaj’s injury, Domingue took over the backup role and has looked like a more competitive goaltender than in his time with Arizona earlier this season. While his .904 SV% and 3.29 GAA with the Lightning aren’t great, it’s still an improvement over Budaj. Domingue has played well enough to give the Lightning a chance to win during his starts, generally being let down by a tired team in front of him instead of him letting them down. So far this season, Vasilevskiy has been a true workhorse for the Lightning, starting 52 of the team’s 66 games. While his play has been Vezina worthy, this heavy workload isn’t necessarily sustainable before a potential playoff run. 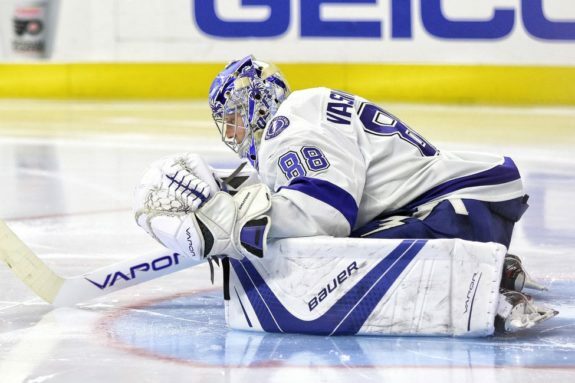 With the Lightning all but certain to make the playoffs, the team needs to be able to lean on their backup more often in order to give Vasilevskiy some time to rest and prepare for the postseason. With these extra starts in net, it should be time for a backup to secure their long-term role with the Lightning. After his less-than-stellar play this season, Budaj left the door open for Domingue to take over the role before he is healthy again. The Lightning won’t be able to carry both Budaj and Domingue on their regular season roster, so they will have to make a decision soon on which player will stay around as Vasilevskiy’s backup. The immediate issue for the Lightning is one of waivers. Since Domingue is past his 30-day/10-game limit with the team, he would need to clear waivers before he could be reassigned to Syracuse. With his solid play in the AHL and NHL, he would be more likely to be claimed now than when he was waived Arizona earlier this year. Budaj, on the other hand, is an older player who is under contract for one more year. This would likely scare away potential suitors for a waiver claim, unless if a team wanted a relatively cheap goalie under contract for next season. Part of the reason why the Lightning are so concerned about losing a goaltender is their lack of depth after their top three. If either were lost to waivers, they would have no reliable third-stringer with NHL experience to call up should something go wrong in the playoffs. 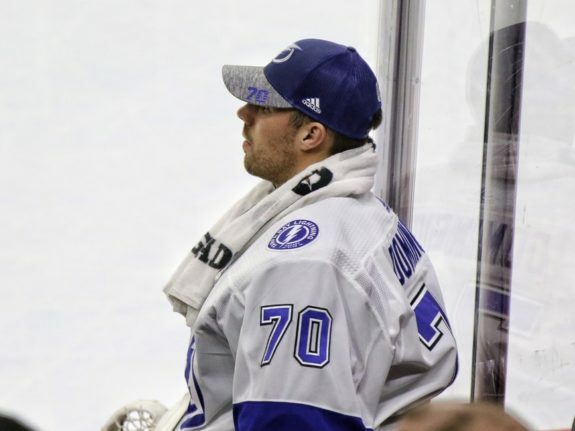 While this is a worst-case scenario, the Lightning have struggled with goaltender injuries in the past, and are likely wary about them as the playoffs approach. Did Yzerman Already Answer the Backup Question? It almost appears that Lightning general manager Steve Yzerman has prepared for the real possibility of losing one of his backup goalies when he acquired AHL prospect Edward Pasquale towards the end of January. Much like Domingue, Pasquale was an inconsistent goaltender whom Yzerman acquired to help stabilize the young Crunch team. Since joining the Crunch, he has looked stellar, posting a 5-1-1 record with a .944 SV% in eight games. While Pasquale is unproven in the NHL, he may be enough insurance for Yzerman to confidently waive one of his premier backups. Should this be the case, it appears more likely that Budaj would be sent down due to his age and contract. While at the start of the year he was the perfect fit for the Lightning, Domingue has slowly taken over his role with the team.